I must confess ........ I am a You Tuber! I found this cute idea on Maria Fennely's channel. Just had to give it a try using Blossom CTMH paper pack. My curious nature ...... again. This box is really neat it stays closed until you push in the side of the box and when you let go it closes again. It would great for a small gift, jewelry, Candy, flower seed packs, gift card ..... lots of things I can think of. Don't you just love the colors. 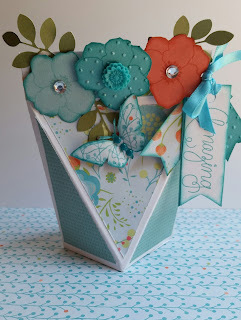 I used CTMH's "Love This" stamp set for the flowers, butterfly and sentiment. So Cute! Here are the instructions I used to make the box. 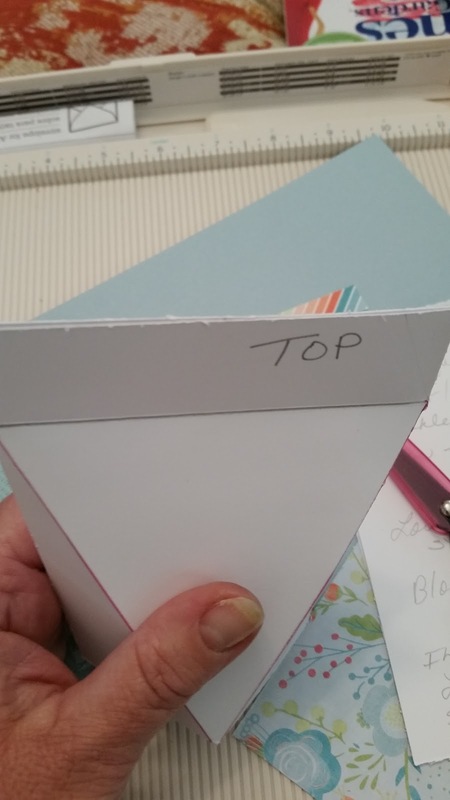 Start with a 8 1/2" x 6" piece of card stock. I used Daisy White so you could see the score lines and cut lines better. 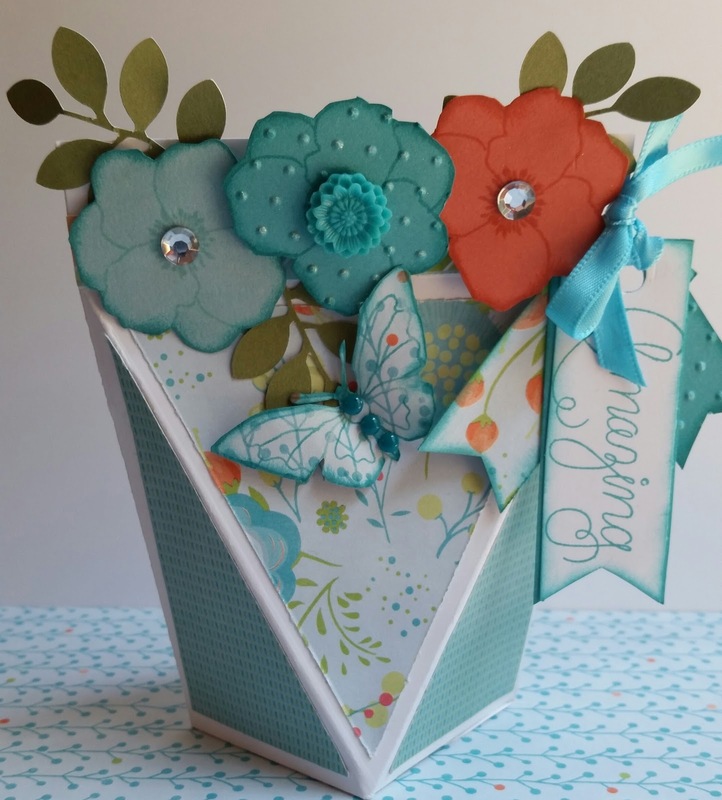 You will also need 2 pieces of 3 1/2" x 3 1/2" B&T patterned paper to decorate the box. First thing you want to do is score your piece of card stock. Turn your paper to short side and score at 1" & 5"
Turn your paper again and score at 2" & 6" just down to the first score line. 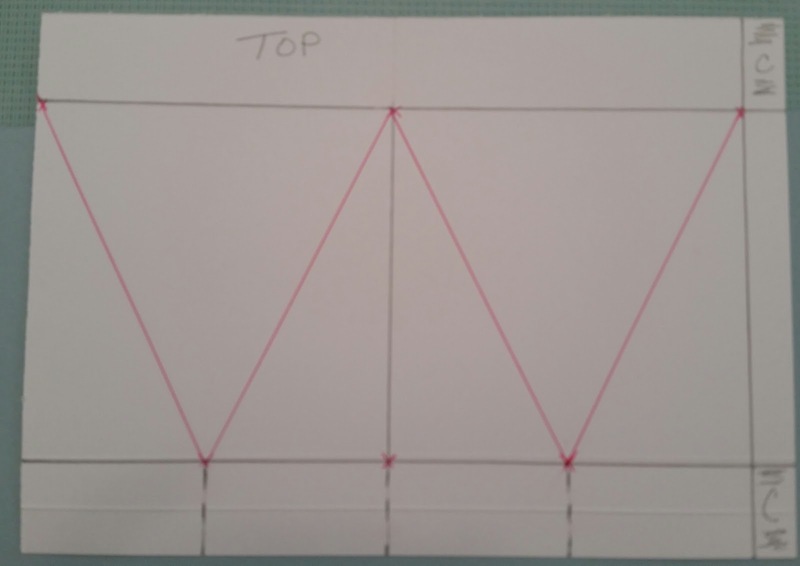 Next time you want to mark the "triangle" score lines (red lines), use a ruler to draw lines from the intersecting lines as marked. It helps if you extend your score lines all the way off your paper. This help you line them on your paper cutter. I use red ink so it would show but you should use a pencil so you can erase the lines after you score them. Cut out the 2 rectangles on the right side to make your tab. 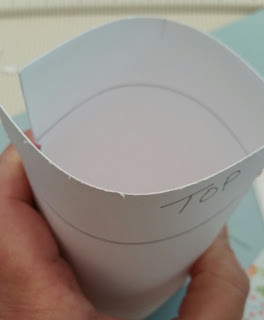 and cut on the broken lines to make your bottom flaps of the box. 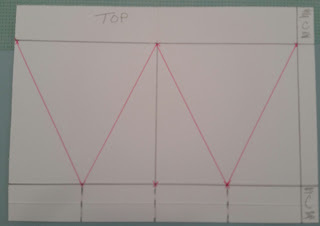 Line up your drawn lines on your cutter (as shown) and score all the red lines. This makes the shape of your box. you will have 2 V shaped areas when you are finished. 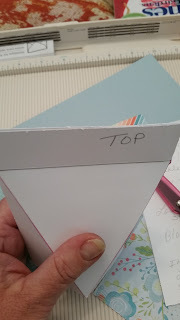 Fold all your score lines using a bone folder so they are nice & crisp. 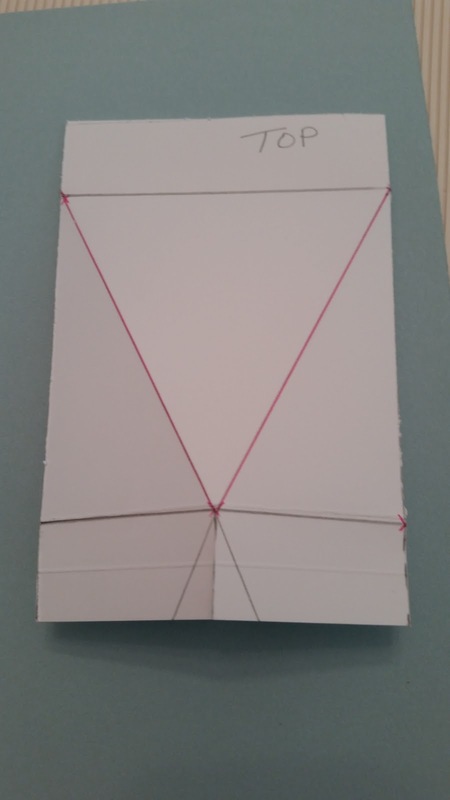 The center straight pencil line is the side of the box it fold all the way from top to bottom. 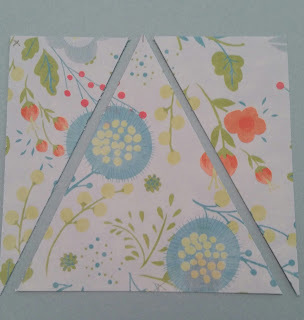 Take your 3 1/2" squares and find the center and mark it. 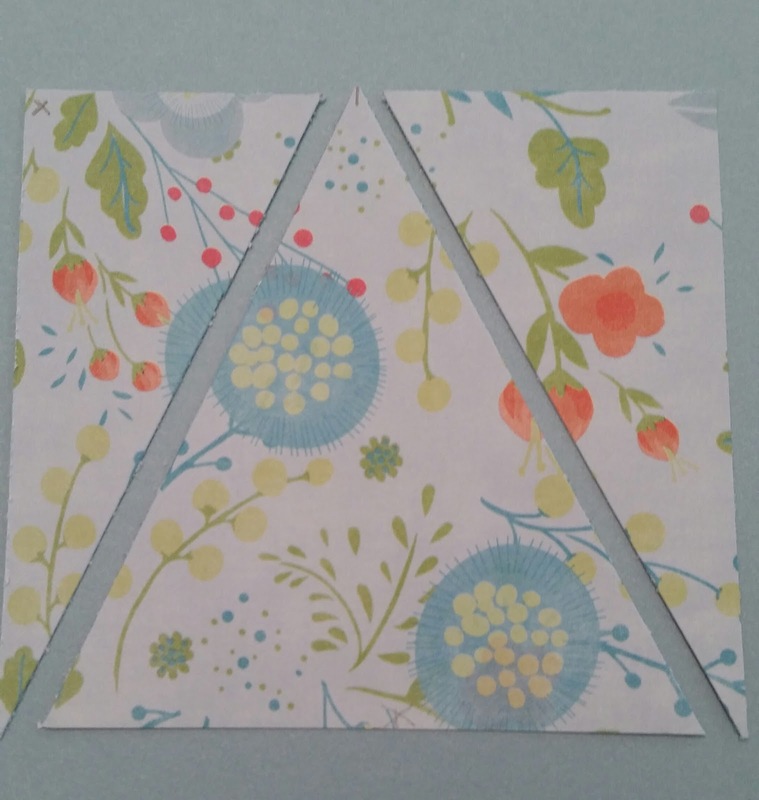 Cut from the center mark to the edge on both sides. You will end up with these shapes. You can turn the small ones over as I did when added to your box. It's easier if you add these pieces before you put the box together. 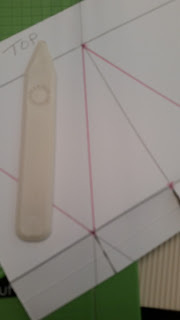 After you add these pieces add adhesive to the outside of your tab and put your box together. This is what it will look like (with your B&T paper added) I forgot to add mine until after this step. Now fold in your bottom pieces. You may have to work with these to make sure they are square. Add adhesive to hold them together. This is what your box will look like once it is put together. Just push in on the sides to open and when you let go it closes back. How cool is that! Ta...Da..... A really cool box. You can decorate any way you want. I used the "Love this" stamp to stamp my floors on card stock, and the butterfly on a piece of B&T paper. I also used the "Amazing" sentiment from the same set. Made a couple banners and tied them onto my box with some ribbon. to decorate my flowers and butterfly, I inked the edges added a Teal resin flower, some sparkles and aqua dots for the butterfly and added my leaves (cricut cut ... Art Philosophy) Now I just have to decide what to put in my box. I Love Crafting! Close to My Heart has so many pretty things to play with. Be Curious and go HERE to see all the "pretties" CTMH has a great selection of products, project ideas and embellishments. 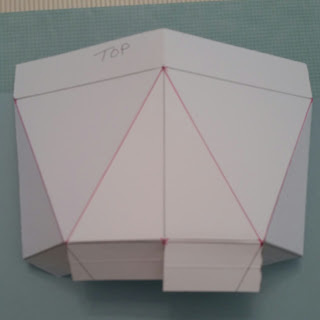 I hope you enjoyed this post and that it will help you make your own box. I would love to see what you come up with. Please share your creation in the comments section. I would love to hear from you and what you think of my pretty box. If you want to keep up with my "Curious" adventures please join my blog or sign up with e-mail. Be Curious and stay Crafty!